Beautiful split level home brings all the comforts of a getaway vacation. Fully furnished home with linen and kitchen utilities provided. Enjoy the evenings looking at the bright havasu stars. Large patio with BBQ and patio furniture provided. Master bedroom has large walk in closet, nice sized bedrooms. Home was built in 2003 and has reverse osmosis. Only minutes away from golfing, boating, and casinos. HDTV Smart TVs with internet and cable services. Hi, this is our vacation home during the late spring through early fall months. 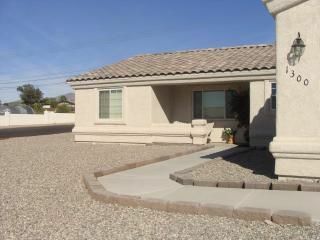 We've had great pleasure in renting the home to couples seeking sun, comfort, and relaxation during the winter months. We bought the home in 2003 and take great pride in maintaining it well over the last 14 years. We love the hospitality aspect of opening our home to others and strive to provide a relaxing atmosphere and keeping everything running as smooth as possible. This property is fairly new with new appliances. It's located near markets, golf course, and lakes. The home offers a split level design which provides privacy for the master bedroom. Cute front porch for evening star gazing and very nice backyard patio for gatherings. New side by side refrigerator. Another side by side refrigerator in the garage if needed. Central A/C, R/O Water Softener, all appliances provided, indoor laundry room, and cable provided. Home is tiled in most rooms with exception to bedrooms and living room. garage available to you. Boat parking available on property. Golf course and lake nearby, local market within 2 miles. Lot's of eateries and local movie theater nearby. Within 6 miles to London Bridge.